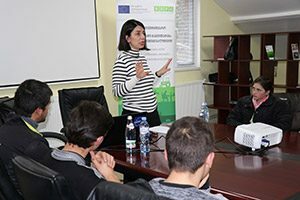 Over 30 young farmers from Tetritskaro municipality and schoolchildren from Tserovani IDP settlement participated in youth event on gender issues organised by Association Rural Development for Future Georgia (RDFG) with EU ENPARD support. 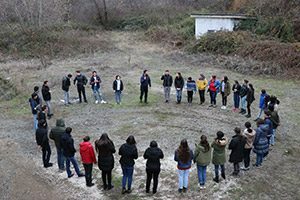 The event took place on 4 December in Tetritskaro, on the occasion of the international campaign “16 days of activism against gender-based violence” that runs every year in the period of 25th November to 10th December. What is gender? What does gender equality mean? How to achieve equal rights for men and women? What is gender-based violence and how to address this issue? – these were the key topics discussed at the event. the sessions were led by invited speakers from human rights field. During the event, the young farmers also met successful, well-known women who shared their stories and tips with the kids to motivate them. The event also gave the opportunity to children from Tserovani IDP settlement to meet their pairs from Tetritskaro municipality and learn more about Young Farmers Centers’ (YFC) activities. Tserovani kids were inspired to establish Farmers Centers in their community. The event was held at RDFG field office in Tetritskaro municipality. It was attended by the member of the High Council of Justice of Georgia, Ana Dolidze, Expert on gender issues Teona Kupunia and the founder of ENPARD cooperative Kona, Natalia Phartskhaladze. “Unfortunately, education system in Georgia, high schools in this case, does not provide knowledge on gender equality. Young people living in the regions lack this information. Domestic violence, that is very common in Georgia, is also a tabooed issue and most often children are victims of abuse. When a child grows up in an environment where the domestic violence and gender inequality is a norm, they may also be at greater risk of being violent in their future. Therefore, such meetings and non-formal education on gender equality is crucial to help them differentiate what is right and what is wrong, what is acceptable and what is a crime” – said Teona Kupunia. The second part of the event was dedicated to thematic activities giving the children the opportunity to discuss gender issues through the fun and entertaining games. The event aimed to raise kids’ awareness about gender issues and bring good examples of active, strong and successful women who can motivate and inspire them. Young Farmers’ Center is an approach of the Association of Rural Development for Future Georgia (RDFG) implemented in Tetritskaro municipality under the EU-funded project “Rural Development for Sustainable Growth of Tetritskaro Municipality” in the framework of the second phase of European Neighbourhood Programme for Agriculture and Rural Development (ENPARD). The centers aim to bring together schoolchildren from rural communities to demonstrate the benefits of modern agriculture as a source of livelihood security and engage them in the development of their own communities. The initiative is seen as an alternative to migration to urban areas.